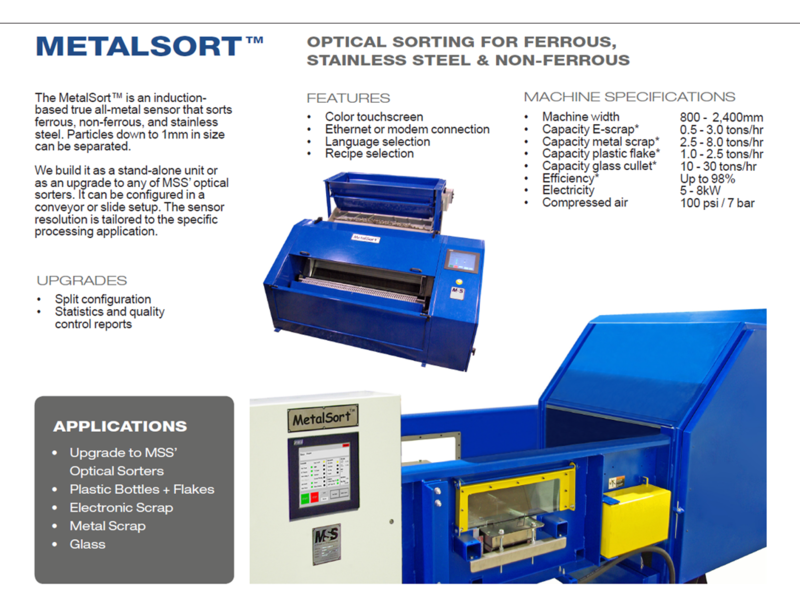 MetalSort™ Is A Versatile Piece Of Sorting Equipment By MSS, Inc.
As a stand-alone unit, the MetalSort™ provides for the sorting of the following different types of metals: ferrous, non-ferrous and stainless. The sensor-based MetalSort™ will provide an excellent sorting performance to recover any residual metals if located downstream of conventional magnets and eddy-current separators, for example in an automotive shredder residue (ASR). The MetalSort™ features an all-metal detector and extracts every last particle of valuable metals. We have built our own induction-based metal detection technology for more than 30 years and the latest generation provides maximum sensitivity at low cost and durability.